It was terrifying. A shaky hand-held camcorder showed a young woman crying and apologizing as snot ran down her face and there was nothing behind her, but darkness. The Blair Witch Project was the progenitor of modern found footage films and helped usher in countless copycats and parodies. 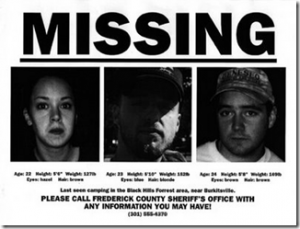 The premise of the 1999 movie was simple… Several years after disappearing, the footage of a small documentary film crew is found in an abandoned cabin. The creators edit the footage together into a movie about their experience. It starts off like any other documentary with interviews with local residents about the Blair Witch and plenty of “off-the-cuff” footage for color. It’s when they enter the forest alone in search of the Blair Witch that they soon become lost and terrorized by heard, but not seen, terrors. One by one, the unseen monsters pick off the crew culminating in the final iconic scene and then silence. Not only was the movie actually scary, but found footage was such a new concept that many people thought it was real. The filmmakers and the studio went right along with it, creating fake-documentaries about the Blair Witch and feeding the public hysteria. People debated the facts about this movie for months, and all the while it was playing to sold out theaters. It played upon the unknown. The idea that what your mind dreams up is bound to be scarier than anything cheap make-up and special effects can create. You never once see anything except flashes of movement. Is it a person? Is it an animal? Is it a monster? No one knew. Studios love these films because they are incredibly inexpensive to make. You don’t use expensive cameras and large crews. It’s a handful of no-name actors in the woods with cameras you can buy at Wal-Mart. There were no special effects to speak of and it used classic horror scare techniques. It was wildly successful, spawned an incredibly bad sequel and solidified itself as an icon in horror. Once the mystery behind the Blair Witch was revealed and people realized that these found footage movies were just fiction, the scare factor dropped. There were tons of low-budget knock offs that tried to capitalize on the genre, but after a while people got tired of it. They were no longer scared by the eerie sounds in the distance. The needed something more visceral. By the mid-2000s, found footage films were losing their mainstream appeal. Low budget movies were still being made for late night cable showings and straight-to-DVD release, but not for theatrical. That is until 2007. Paranormal Activity grew from a cult base until it was finally distributed widely on theaters. It helped turn the found footage on it’s ear by keeping the guerrilla style film making, but adding something unheard of…special effects. The story of a young woman being terrorized by a demon in her home while her boyfriend obsessively films every second is standard found footage fare, but instead of being disembodied voice or rustle in the breeze, the audience was actually able to see it. Footsteps appeared on the floor. Blankets moved off the bed. Chandeliers suddenly swung back and forth. At best, it’s film making flim flam, but when you see it though a handheld camera or security feed, it makes it seem real. The film was a mix of good editing and parlor tricks, but it was enough to terrify the masses. It’s spawned three sequels with each on trying to outdo the other and many knockoffs. Found footage hasn’t changed much since the days of Blair Witch, but its beginning to creep into mainstream movies such as Sinister. Found footage is far from and we’ll have to see how long it takes the public to cry out for something more. Other found footage films include The Last Broadcast (1998), Cloverfield (2008), Diary of the Dead (2008), the REC films, The Last Exorcism (2010), Apollo 18 (2011), Project X (2012), Chronicle (2012) and Barry Levinson’s upcoming The Bay (2012). Michael Bay has one coming soon called Almanac.